Melbourne is quite possibly the most incredible city I’ve been to yet—but actually finding cheap things to do in Melbourne is a bit of a challenge. Melbourne has everything you’d need plus a plethora of things you want and it’s all set in intricately beautiful buildings that are surrounded by lush parks. Melbourne city isn’t your typical concrete jungle by any means. The people are lovely, the infrastructure is extremely effective, and it’s just so damn cool. BUT it ain’t cheap! Melbourne can be quite pricey, in fact, let’s face it, the whole country is. But I’ve dug deep and made a list of some free and cheap things to do in Melbourne that can get you by. So what to do when you’re broke? I got your back on this! 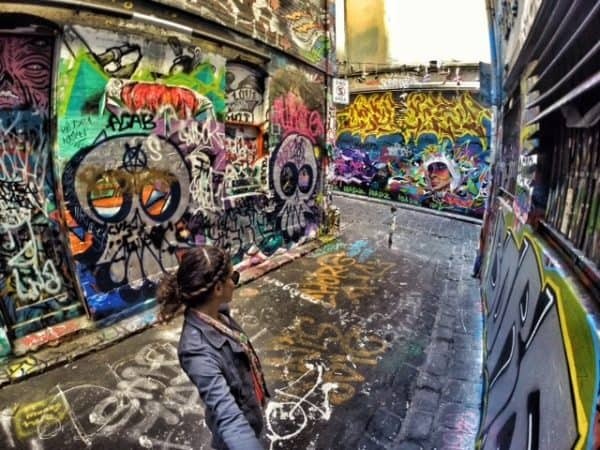 After living here for 6 months and saving every penny I owned I found the best free and cheap things to do in Melbourne! Hopefully, this helps you save a bit while still enjoying this incredible city! Melbourne is literally littered with parks. There’s a park everywhere you look. Since I lived in Carlton, Carlton Gardens was my neighborhood park, but Edinburgh was a close second. Bring a picnic and even some wine, people drink at the parks here! Just don’t be a moron about it. Queen Victoria Gardens has sculptures and the Shrine of Remembrance is just next to the Royal Botanical Gardens. There are paths of greenery everywhere here. Plop down with a book, wine, just to chill, whatever! 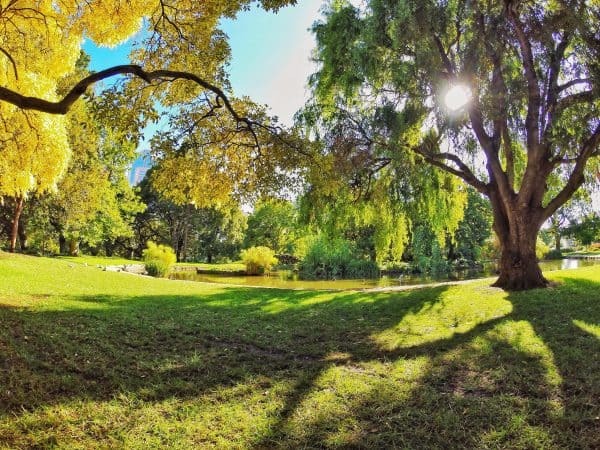 A free thing to do in Melbourne—Parks! It’s like a step back in time. It’s a really cute and quaint beachy town with better beaches than St.Kilda. The best part is, it’s a super cheap thing to do in Melbourne because all you need to pay for is your train ticket. I LOVED this spot. 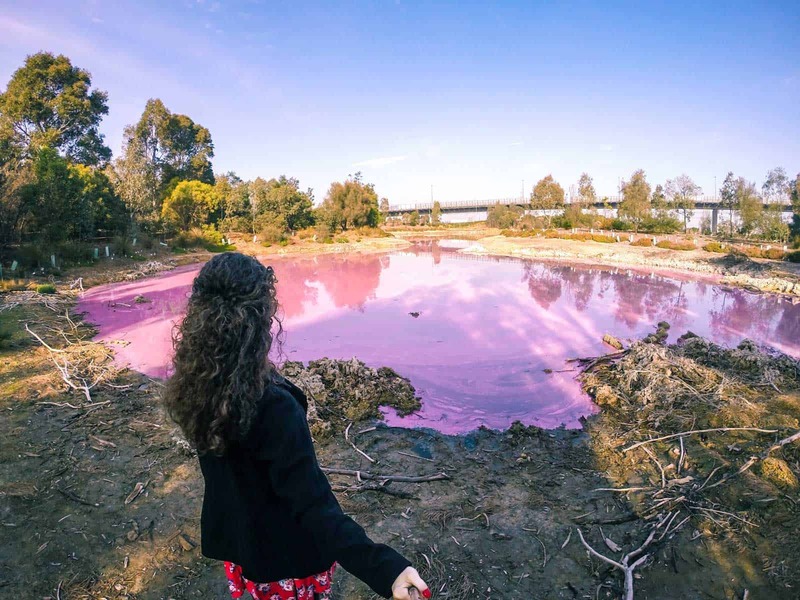 Located in Westgate Park, you will find a Pink Lake. Literally, no joke, the lake is pink. Due to natural algae, you’ll see something you don’t get to see every day! It’s pretty cool and a stroll around the park after will make for a chilled out afternoon. This is still a relatively new thing on the list of things to do in Melbourne, so it’s hardly crowded. We only saw maybe five others the entire time. Careful: If it’s been raining or weather has been nasty, it could just look like a regular old brown lake. 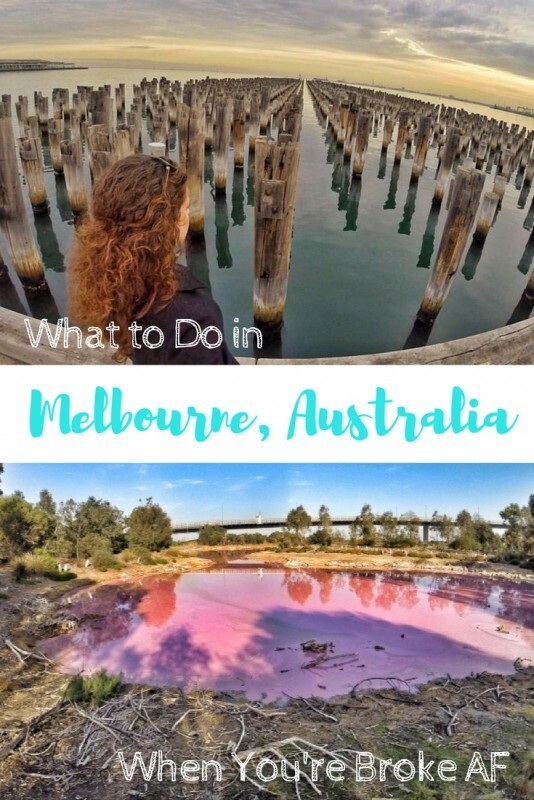 One of the coolest cheap things to do in Melbourne— The Pink Lake! 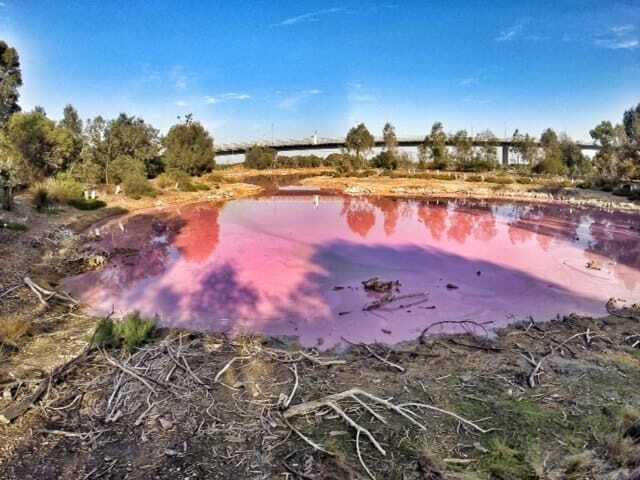 Only about 15 minutes from Westgate Park and its Pink Lake is Princes Pier. This was the first thing many WW2 immigrants saw when they came over to Australia to seek refuge. The pier is a humbling place to be when you think of all the history. They left the pier’s stumps jutting out of the water after they rebuilt it which makes for quite a cool spectacle. Princes Pier is totally free and super pretty. 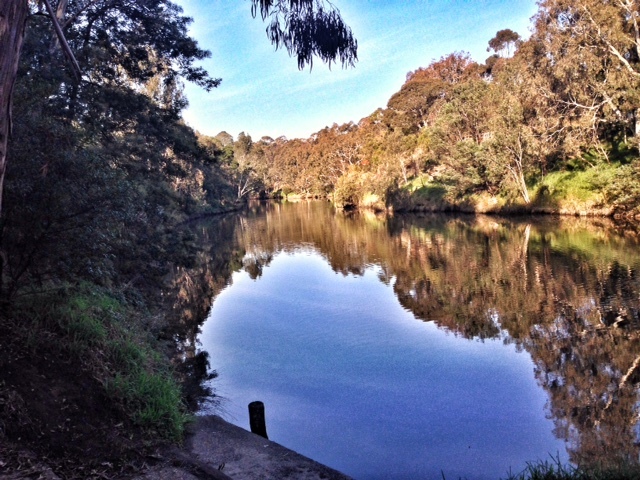 There’s a trail along the Yarra. You can go from the city up to Abbotsford and all around the east side of Melbourne. Get those runners on and go for a walk! Pretty much all the museums cost money. If you bring your student ID, you can get a discount/get in for free. NGV is actually free, but any special exhibitions will cost extra. 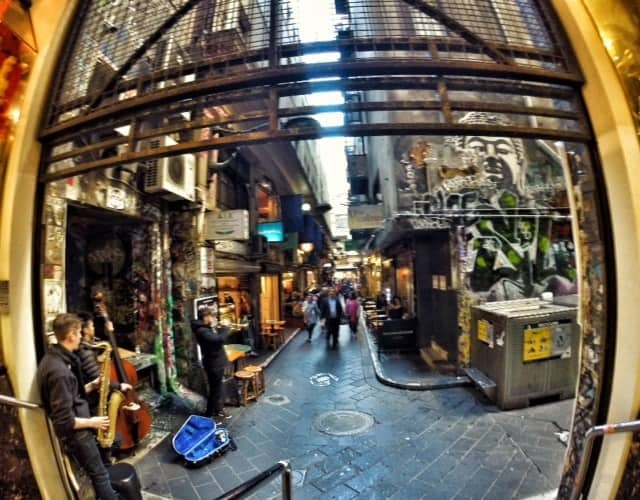 The laneways are probably my favorite free things to do in Melbourne. The graffiti here is simply and truly remarkable. Street art in Melbourne is EVERYWHERE. Street art! It’s a totally free thing to do in Melbourne and it’s everywhere! Speaking of wandering around and getting lost, you can do it all day and never get bored in Melbourne. Not only will the graffiti captivate you, but the architecture as well. The buildings are really something else. The old gothic churches and Victorian buildings are so charming and beautiful. Another one of my absolutely favorite things about this city! This is NOT your average run of the mill city where it’s a concrete jungle of the same buildings that could be anywhere. The buildings are preserved well and you can find yourself walking into an H&M that looks more like a historical palace. With every step I wandered around the city, I felt more inspired and gracious to live amongst the history and beauty of the funky and fresh capital of Victoria. HO.LY.CRAP. Melbourne takes coffee seriously. Like, VERY seriously. I’ll be perfectly honest with you, you don’t even know what real coffee is until you’ve been to Melbourne and had a proper coffee. I could talk for hours about all I’ve learned about the coffee scene in Melbourne, it’s crazy, it’s real, it’s SERIOUS coffee. Just walk into a shop and see for yourself. Coffee is a CULTURE in Melbourne, not just a drink. BUT don’t you dare ask for a “coffee.” What type of coffee do you want? A long black? A macchiato? A cappuccino? Australian’s don’t have just “coffee” and you WILL get a weird stare if you ask for it. Looking and you Americans! 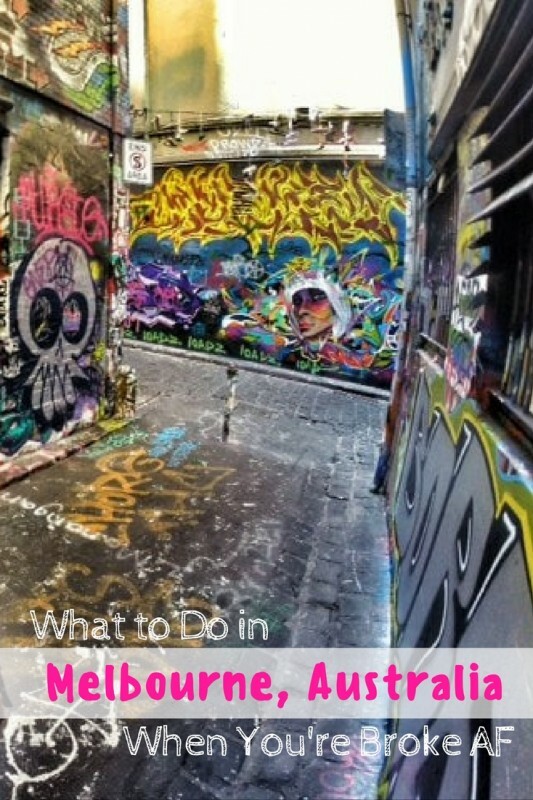 So what’s one of the best and cheapest things to do in Melbourne? DRINK COFFEE AND LOTS OF IT! Campos in Carlton! Literally two seconds away from where I lived. Their cold brew will have you reeling for HOURS. I’m convinced it’s laced with speed. Aunty Pegs in Collingwood is out of the world! They have a factory in the back and have done crazy things to coffee like adding nitro to coffee and having it on tap as a nitro cold brew. DELICIOUS! They switch their coffees up all the time and give you little slips of paper with info on each of their carefully crafted blends. The staff is friendly and knowledgeable if you want to pick their beans, I mean brains! 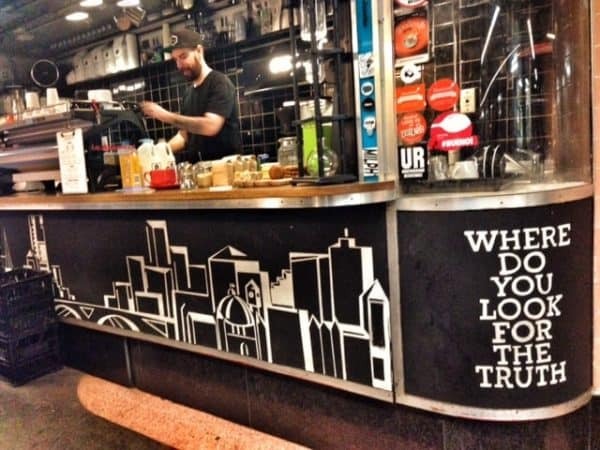 Cup of Truth at Flinders Street Station. A tiny coffee shop that serves up a good brew in a dungeon-y hall of the famous train station. Black Cat in Fitzroy is a place to just be. You will see all sorts of characters walking in and out of this eclectic cafe that also is a bar. Grab a coffee or different bevy of your choice and people watch. If you need some decent wifi, Melbourne has EXCELLENT libraries and they all have free wifi. State Library of Victoria – Huge, incredible looking both inside and out, many desks and nooks to hole up in, the internet can be weighed down at times due to the volume of people. Melbourne Library (near Flinders Station) – Small, but accommodating. There are a decent amount of desks and outlets to use. Katherine Symes – This became a favorite because it was so close to our house, and was a bit less busy than the Carlton Library. There were semi-private rooms in which you would share with only another person or two if it was busy. Carlton Library – This was our favorite until we found Katherine Symes. This one has a lot of families. I came here to work so it was a bit distracting at times. I didn’t personally do this as I lived in Melbourne and gave myself a tour every day, but if you’re just visiting and want to see the hot spots right away, there’s a free walking tour every day! Just tip the nice tour guide at the end. This is the cool backpacker spot and where lots of hostels are. Go chill on the beach for the day! The beach isn’t really the nicest, but it’s still a decent spot to hang for the day and watch the kitesurfers and penguins. Yep, at dusk/right after sunset you can see the cutest little penguins (literally the smallest in the world) at the St.Kilda pier! Look out for the guides with the bright vests on, they will help point them out. I hula hoop. Total weirdo, right? OK, so besides cooking for yourself, how else can you get a good cheap meal? 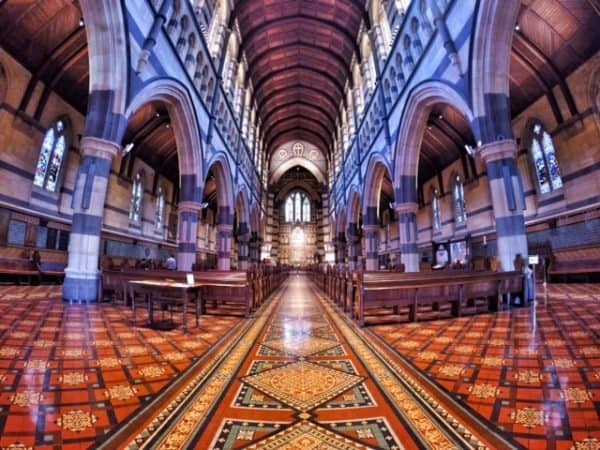 Timeout Melbourne has a fab list of places to go for under $20, but here are my fav’s and they are even cheaper. Down a small dark and dingy alleyway in the CBD holds some of my fav little sandwich shops. I can honestly tell you I don’t even know the names of these places but I’ve eaten on this street a hundred times. Chock full of a little hole in the wall type cafes, Center Place (the street across from Degraves) is a budget eaters dream. Soup, salad, and sandwiches (my three favorite s’s) are what’s on offer here along with coffee and perhaps a few other treats for a BARGAIN. Regularly costing about $5-8 for a sandwich, if you wait until just a bit after lunch, say after 2 pm (I’m a late eater) you can get a big and delicious sandwich for $3! This is the street to find the cheapest food in Melbourne! So you can do what we used to do and get some of Domino’s alright tasting $5 pizza when you go and pick it up. OOORRR you can go to Thresherman’s Bakery in Carlton and spend just one dollar more for an even better-tasting pizza and support a small business and not a mega-corporation. Tot’s worth the extra buck. BONUS: At night, they will put some of their treats (cakes and other dessert items) on special to get them sold for the day. Bread too! I wish I got to go here more often. Set in a gorgeous Convent in Abbotsford with gardens and church bells, it initially feels like you’re in the wrong place. Walk around the convent and to the back and you’ll find Lentil as Anything nestled in a homey setting. At Lentil As Anything, the food is vegetarian and is made fresh by volunteers every day. This restaurant isn’t your typical restaurant as you don’t get a bill at the end of your meal. Scattered around the dining hall will be little treasure chests for your donations for the meal. That’s all this place runs on! So scoop up whatever food is on special at the buffet for the day and be sure to donate accordingly! Free meals are available to those in need, REALLY in need, so please show your support and help them out while having a fantastic veggo meal. Def go to Victoria Market! Here are the hours the market is open and if there are any special events going on. Get yourself a mulled wine or a hot cider during the winter (at the Wednesday night market) and if you’re indecisive about what to eat, go here and have a bit of everything within 5 minutes walking distance. It’s just north of the city. Victoria Market is also a good market to get some amazing fruits and veggies to cook something for yourself. You can get things cheaper when you buy in bulk/ when you buy the stuff that is close to going off and needs to be eaten within the next couple of days. This place isn’t even THAT expensive depending how much you drink but it’s a sweet spot to chill out with a beer and enjoy some live music. You can go upstairs and see their brewing factory too which of course, my beer crazy boyfriend was a huge fan of. OoOOohHhhhHHHooOO!!!!! Get those pinky fingers ready people this place is just so cool and fancy. Definitely, don’t rock up in flip-flops and a t-shirt, and you should probably come early or make the reservation. It gets PACKED and for good reason too. Their drinks are crafted to the highest of standards, using incredible ingredients. Garrett had a honey bacon-infused bourbon Old Fashion that they make in-house, yeah… it’s crazy. The setting is warm and cozy, it’s like a 50’s speakeasy type of place where their waiters are adorned in suspenders and an abundance of whiskey and spirit knowledge. This place is quite possibly the epitome of hipster and I loved it. Oh, and did I mention it’s located down a dark alley behind a secret door that has no sign? Uber awesome! 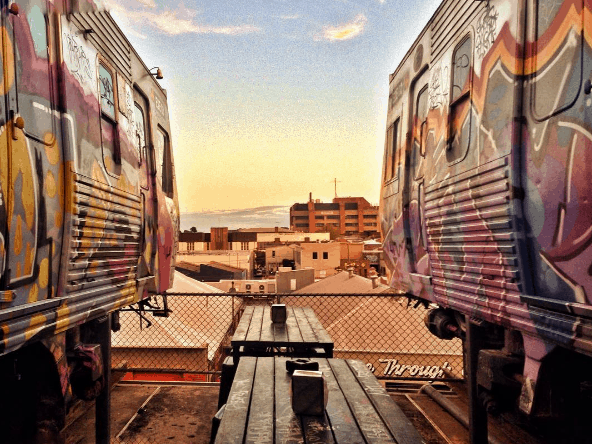 Some of the best burgers in town served in an old train car that’s on top of a building overlooking Melbourne. Do I need to say anything else? I guess I could mention there’s mac and cheese too? As far as cheap things to do in Melbourne, this is a pretty reasonably priced place for the entertainment and food value provided. Buy burgers but cop a free view! You win! They were voted as having the best margarita pizza in the whole world! It was pretty damn good, but saying it’s the best is, of course, according to your own personal taste. Definitely worth a go if you LOVE pizza like we do. They make their own ice cream and it’s actually reasonably priced. It’s $6 for two scoops in a cone and they are heaping scoops too. Delicious! If you want to treat yourself in the form of entertainment, Melbourne is definitely the place to do it. There is constantly something happening. Whether it’s a music festival, comedy month (we went to a show! ), or a huge night event like White Night, take yourself out! Here’s a link to what’s on in Melbourne any night, any day. And if music festivals are your thing, check out these amazing music festivals in Melbourne. Have you been? 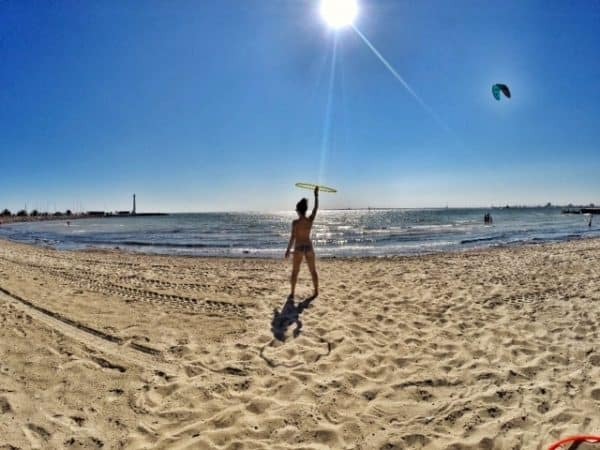 What other cheap things to do in Melbourne can you contribute for those wondering what to do in Melbourne? On the way to Melbourne? What cheap thing will you get up first? Pin this to help your mates out! Ah I went to most of these places Nina, makes me miss Melbourne! I’d always either be biking around…mainly the Capital City Trail, or taking the train for $3 to Belgrade for some hikes to. And St. Kilda a lot! Nice Ryan! Thanks for those additions. I miss Melbs so much too!